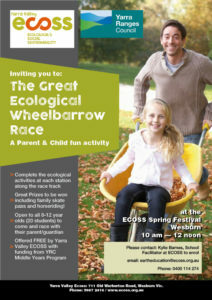 An invitation to The Great Ecological Wheelbarrow race. Open to all 8 to 12 year olds to come and race with their parent/guardian. Offered FREE by Yarra Valley ECOSS.